The attraction of The Jackson Laboratory (JAX) to Connecticut is a direct result of the state’s investment in Bioscience Connecticut. The Jackson Laboratory for Genomic Medicine enables Connecticut to assume a position of global leadership in developing new medical treatments tailored to each patient’s unique genetic makeup. The Jackson Laboratory is an independent, nonprofit biomedical research institution and National Cancer Institute-designated Cancer Center based in Bar Harbor, Maine, with a facility in Sacramento, California, and a total staff of about 1,500. Its mission is to discover the genetic basis for preventing, treating and curing human disease, and to enable research and education for the global biomedical community. What is The Jackson Laboratory for Genomic Medicine? 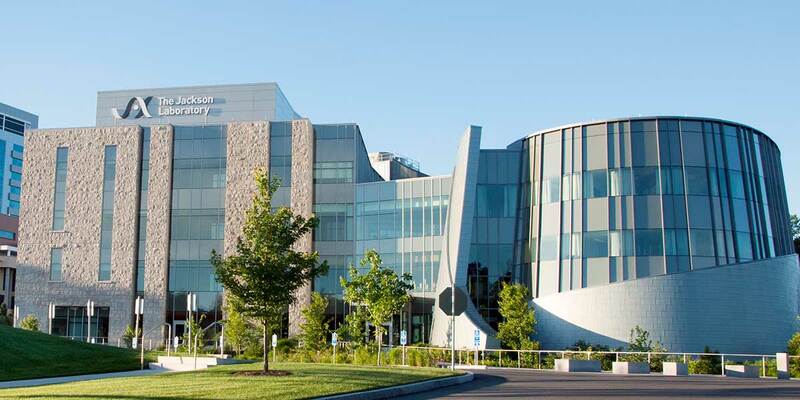 The Jackson Laboratory (JAX) built a new nonprofit research institute in Connecticut with support from the state’s Bioscience Connecticut initiative. The new institute, a 501 (c) (3) charitable organization, draws upon The Jackson Laboratory’s eight decades of research and the medical expertise of Connecticut’s universities and hospitals. JAX Genomic Medicine works to discover the complex causes of disease, develop diagnostics and therapeutics, and build Connecticut’s bioscience industry. The JAX Genomic Medicine facility is an expansion, not a relocation, of The Jackson Laboratory. JAX will continue to grow its basic research campus in Bar Harbor, Maine, while the new facility in Connecticut focuses on medical applications of genomics with academic and clinical research partners from Connecticut and around the world. Why is JAX Genomic Medicine important to better health care? The genome is a complete genetic blueprint that is unique to each person. JAX Genomic Medicine will investigate how each piece of the genome contributes to health and disease and how our genomes can guide personalized medical care tailored to the individual. JAX researchers will collaborate with Connecticut’s leading medical institutions—including the University of Connecticut Health Center and the Yale University School of Medicine—along with hospitals and physicians across Connecticut. JAX Genomic Medicine will unite doctors, patients, scientists and industry to find new ways to predict, prevent, diagnose and treat diseases such as cancer, heart disease, infectious diseases, Alzheimer’s and diabetes. Why is JAX Genomic Medicine important to Connecticut’s economy? JAX Genomic Medicine establishes Connecticut as a leader in the high-growth field of genomic-based, personalized medicine. It stimulates long-term job growth in the bioscience industry by attracting a critical mass of scientists, clinicians and technical workers. The institute will employ 300 people within the first 10 years and more than 600 people within 20 years. Discoveries at JAX Genomic Medicine will speed the creation of a new biomedical industry and businesses in the region, and the Laboratory’s presence will spur other job creation in Connecticut. Jobs in scientific equipment, supplies and technical services will support JAX operations, while jobs in housing, retail, energy, food, education and transportation will support JAX employees and their families. The human body consists of about 20 trillion living cells, each containing about 23,000 genes. This entire collection of genes is called the genome. The genome contains the instructions for making and sustaining a human being. Mutations in the genome increase disease susceptibility and initiate cancer. Genomics research reveals how the genome affects health, disease and response to drugs. Deciphering this complexity is essential to creating better medicines and using existing medicines more effectively. How is genomics leading to personalized medicine? Rapid advances in technology have made it feasible to identify a person’s unique genome. One person differs from another by millions of variations in the genome, and many of these variations affect susceptibility to disease and response to treatments.Greater understanding of individual genomes is allowing scientists and clinicians to begin to "personalize" medicine. Increasingly, disease prediction, prevention and treatment will be tailored to each patient’s unique genome, including the makeup of one's tumor or infectious microbes. Doctors will be able to assess a person’s risk of cancer and recommend preventative measures. And physicians will be able to prescribe the most effective drugs with the fewest side effects, based on the patient’s genome-driven response to those drugs. The personalized medicine revolution will yield more effective medicines with fewer adverse side effects and lead to longer, healthier lives and lower health care costs. The personalized medicine industry in the United States already generates $286 billion per year in revenues and is growing by 11 percent annually, according to PricewaterhouseCoopers. Research at JAX Genomic Medicine will contribute to personalized medicine by revealing how genomic variations affect health, disease and drug response. What is The Jackson Laboratory? The Jackson Laboratory is an independent nonprofit research institution headquartered in Bar Harbor, Maine, with a facility in Sacramento, California. Its mission is to discover the genetic basis for preventing, treating and curing human disease, and to enable research and education for the global biomedical community. JAX was founded in 1929. JAX is a National Cancer Institute-designated Cancer Center. Three dozen research teams at JAX study the genetic basis of cancers, heart disease, osteoporosis, Alzheimer's disease, glaucoma, diabetes and many other human diseases, as well as how genes impact development, reproduction and aging. JAX employs more than 1,200 people in Maine and more than 100 in California, with more than 200 Ph.D.s, M.D.s and D.V.M.s. JAX’s operating budget for FY2012 is $212 million. JAX received $56.8 million in NIH and other government grants and contracts for research in FY11. Is The Jackson Laboratory a business? The Jackson Laboratory is not a business. It is a 501 (c) (3) nonprofit charitable organization. It has no stockholders and pays no dividends. Any financial surpluses from its operations are invested in further research and educational programs to meet the Laboratory’s mission. What has The Jackson Laboratory contributed to medical science? an in-depth understanding of the immune system’s major histocompatibility complex, making organ transplants possible. This work earned JAX scientist George Snell the Nobel Prize in 1980.